Applebee’s just announced that they will again say “THANK YOU” to our nation’s veterans and active duty military by inviting them to their neighborhood Applebee’s for a free meal on Veterans Day, Friday, Nov. 11, 2011. “On this national day of respect and remembrance, Applebee’s is honored to salute veterans and active military for their service to our country. As you may recall, Applebee’s initiated this program nationwide for the first time two years ago. As a result, we have provided more than one million free meals annually, ” Applebee’s announced. 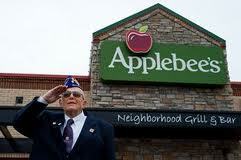 Each year, Veterans Day turns into a military reunion at Applebee’s in neighborhoods across the country. Veterans and active duty military from across generations enjoy great food as they share stories from their time serving our country. This year, Applebee’s is offering a Veterans Day menu that includes some of its signature and favorite items. Share this information with as any veterans and military personnel as possible, so that they are aware of this open invitation. This includes telling members of your post, their families, friends and colleagues. Our extended families have veterans that may not be a member of a military fraternal group. All U.S. veterans and active duty personnel with proof of current or former military service will be treated to a free meal at all Applebee’s in their respective neighborhoods on Veterans Day, Friday, Nov. 11, 2011. Proof of service includes the following: U.S. Uniform Services Identification Card, U.S. Uniform Services Retired Identification Card, current Leave and Earnings Statement, Veterans Organization Card, photograph in uniform or wearing uniform, DD Form 214, a Citation or Commendation.